These two chapters are a part of what is referred to as Jesus’ teaching, “The Sermon on the Mount”. Herein is contained the Beatitudes, Jesus’ teachings on the Law (murder, adultery, divorce, oaths, enemies, and love), and also teachings on giving to the needy, prayer, fasting, treasures, and worry. So yeah. Matthew 5 and 6 are pretty full-up of good teaching and great insight into how Jesus felt about lots of stuff. 3. Prayer. (6: 5- 7). Again, Jesus says “when you pray …”. Brad and I are very good about praying before meals, and also before we go to sleep. But I’m really bad about praying on my own. This is something I struggle with constantly – how to pray. Wow. If Jesus is my rabbi like I claim He is, I’ve got a long way to go! I’m encouraged though. Normally I hear motivational speakers, get pumped up, and forget their words within a day or two. I’m still chewing on this guy’s words two weeks later – I think he’s on to something! Ray told us that Jewish disciples LIVE WITH their rabbi – so that they can’t help but become like him. Oh, how I wish I could live with Jesus. But you know the crazy thing? I can. I have the Bible, and all of his teachings are there. Now, I’ve just got to open it up and dive in. I don’t think I ever posted about the issues I had with the Passport people before I went to Mexico did I? Shall I share then? Great! My parents booked my flight to Mexico in my married name (silly me assumed all the name-change stuff would be done by then! ), so I needed to add my married surname to my passport. So, I looked up on the website what I needed (a letter stating that I want it added, what the new surname is, etc.) and some ID. SOOOooOOO, Brad and I go to the passport office (it’s quicker in person, and Brad needed to apply for the first time), hand our stuff in and leave. Easy peasy!! So, a couple weeks later, I get my passport in the mail. I’m so excited that I open the envelope while on the phone with a friend, M. and completely stop mid-sentence. “One sec.” Say I to M.
“What’s wrong?” Asks M., hearing the incredulity in my voice. Brad is hovering nearby. “What??! ?” Ask Brad and M. simultaneously. I tell M. I’ll talk to her later and hang up, completely confused. So apparently when you ADD a surname, they just stick a sticker in your passport that says, “The bearer’s married surname is (insert completely incorrect surname here)”. I go on their website. It doesn’t say anywhere what to do if your passport has the wrong info in it. I call Passport Canada. After waiting probably 15 minutes on hold, I am told that I’m just going to have to go back and talk to them at the office. I feel badly for that lady – I was NOT a happy camper! So, this is Thursday, January 25. We leave on February 3. One week. Passport Lady takes my passport. “Pardon?” I am not impressed. “A new photo.” Completely unimpressed. So I go. With my application. To the photo guy. While the photo is developing I frantically try to fill out the passport application (who knows the address of their school off by heart? place of employment? two friends, their addresses and phone numbers? gah!!!). He’s trying to get rid of me. I cringe and try not to scream. I finish filling out the application, with the help of Passport Lady who ends up having to look up my friends’ addresses and phone numbers online. I hand it in. It will be ready by the time I get back from school, I’m told. It was. I got to Mexico fine, I got back fine. I thought that was the end of it. “Yep! So …” Details, details. A security warning? My passport? What if this had happened while I was in Mexico?!?! I am assured that everything would have been fine. Just a quick post to announce that my big sister is pregnant!!! WUHOO!!! She’s 11 weeks now, and she and her brand-new husband go to the doctor on Thursday to hear the heartbeat – so exciting!!! Her blog has been added to my links (baby doe), so yey!!! Congratulations, Jenny and Shaun!! So now that my wrist warmers are done, I’m ready to get back to Brad’s hat – we even went and bought yarn yesterday, which we then promptly left at his parents house. Sigh. We’re getting it on Monday night though, and I’m looking forward to getting that hat done! I’ve added a few links to my favourite links – i spoke too soon and Crystal Clear. Um. Wow. I really thought that I might actually have something to say, but it seems that I’m now drawing a blank. Picture website, new blog and TWO warm wrists! I got to sleep in, which was oh-so-nice =) And then, since Brad is busily working on homework (thumbs down to homework on reading week!) I got to fool-around on my computer all day! SOOOOOOOooo, I decided that since I do *not* write about nursing enough to justify naming my blog about it, I would change it 🙂 If you want, let me know how you like the new name and/or if you ever visit my blog by leaving a comment!! Also new to the blog is a picture website that I organized today, hosted at dotphoto. It currently has lots of pictures from my wedding, my big sister’s wedding, and from our vacation in Mexico. It’s first on the links menu (see right), so click on there if you want to see pictures – just type ‘kimbrad’ as the guest password =) I hope you enjoy! And, for the piece de la resistance, les wrist warmers!!! Well. I think that’s enough updating for today! Have a good evening, all! Edited to add: … coolest picture ever! 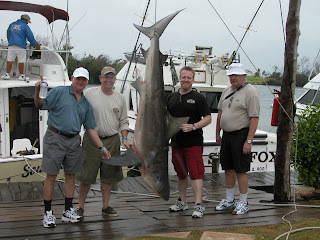 Check this out – my dad (on the far left) caught a SHARK while we were in Mexico!!! A shark!! And, if you’re a nature guru, it’s a bull shark, which means that it’s one of those sharks that likes to eat people. And it was in the boat with them. Alive. For like, 45 minutes. Alive. With it’s jaw flapping. Yep, just one warm wrist! But the other is soon-to-be warm! It’s so satisfying to finish objects. Brad’s hat is calling to me and making me feel bad. I DON’T HAVE THE YARN, HAT!! GIVE IT UP! ONCE I GET MORE YARN, I WILL FINISH YOU! I PROMISE! I’ve got school today from 12:30 – 3:30. I’ve realized that although the title of my blog would lead you to beleive I talk about nursing a lot, it’s rather misleading. Confidentiality laws what they are and all, it makes it kind of hard to post about my clinical days other than “it was interesting and I learned a lot.” Hrrmmph. Maybe the name needs to be changed to … The ‘L’ Stands for “Loser” or ‘K’ is the first letter in the word “knit”. Maybe I’ll leave it for now and come up with something witty later. SooOoo, as promised, here’s the best of the best from our trip to Mexico. As you can see, it was stunningly gorgeous there! I’ll just let the pics speak for themselves.